Last update focused on the short term, and gave targets of 2170 and 2163 for SPX, both of which were captured, and both of which generated reactions from the market. 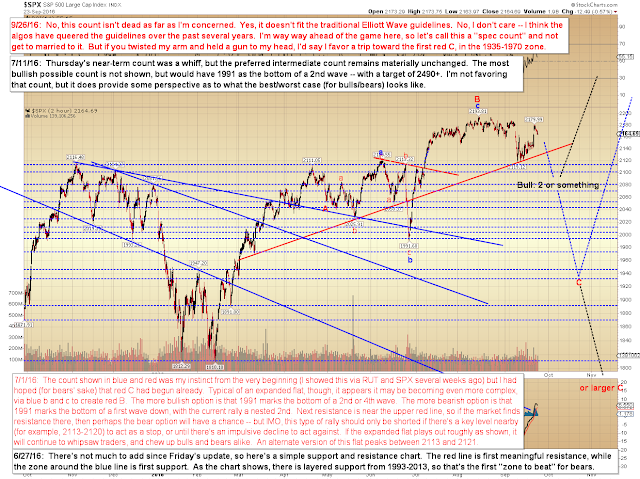 The third near-term target of 2156 could be reached at today's open. We're also going to look at some intermediate options today. 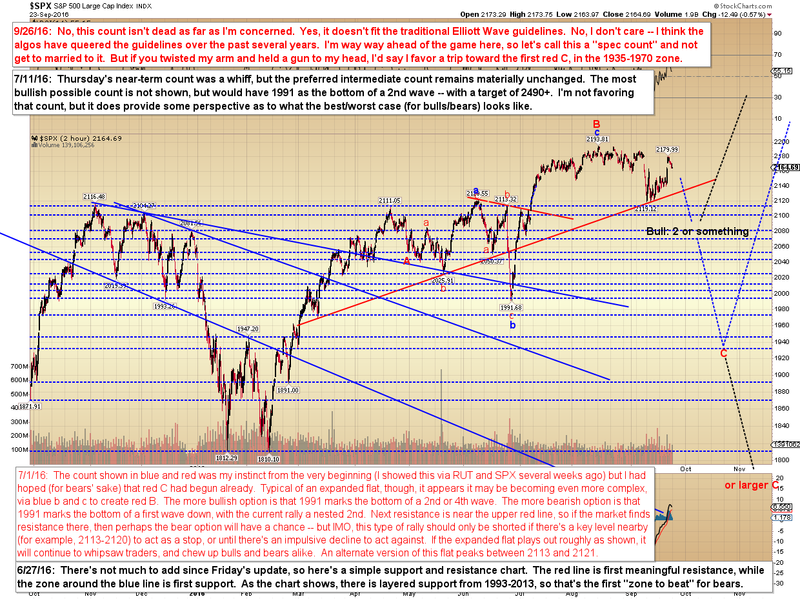 First is the updated near-term chart. A new low at today's open will give this decline a reasonably-impulsive appearance, which would suggest at least a near-term trend change. Intermediate-term, I haven't written off the idea that the rally from 1991 SPX has all been part of a larger, ongoing corrective wave. But this is pretty far ahead of the game -- heck, maybe the recent lows will hold and we'll rally straight on to new highs from here. 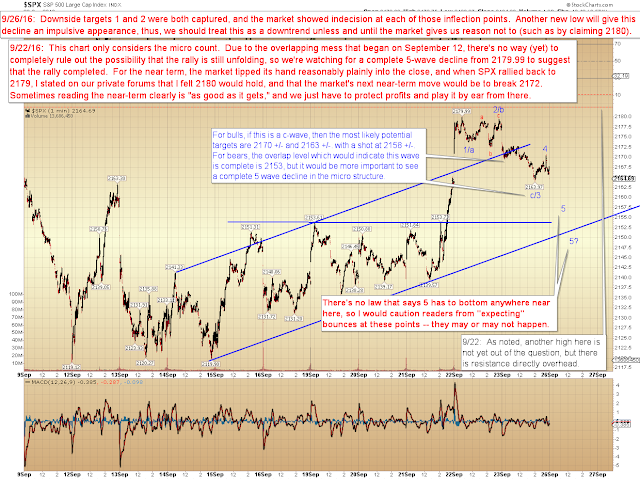 Needless to say (or: as said in depth last update), bears should be very cautious if SPX makes a new all-time high. In conclusion, a new low at today's open will give the decline from 2179.99 a reasonably impulsive appearance, and suggest that the decline from said level will be at least two legs. It also makes me even more inclined to believe that the bounce from 2119 was corrective (thus not the start of anything meaningful, and destined to be broken). 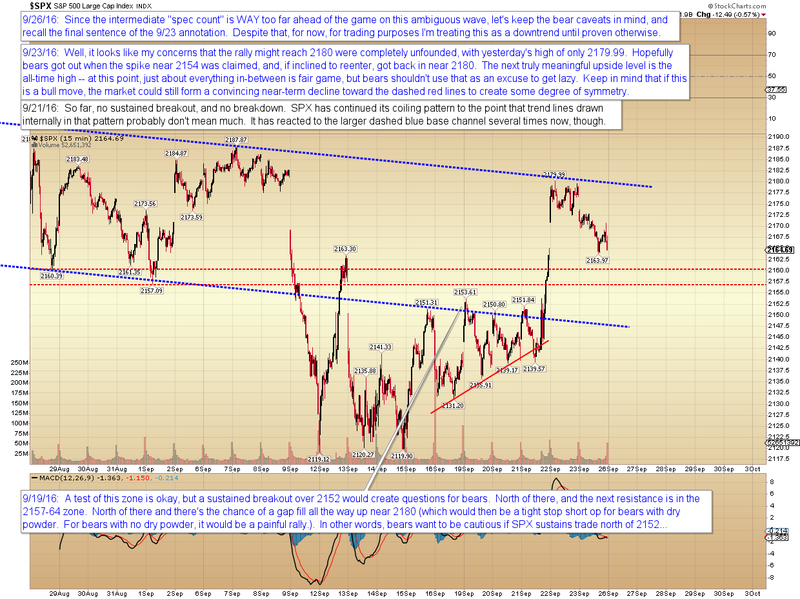 The bull option is that the bounce from 2119 is corrective, but is part of a triangle or similar. Nevertheless, unless and until SPX claims at least 2180 (for the cautious) and the all-time-high (for the less cautious), I'm inclined to believe bounces should continue to be sold, and inclined to believe there could be a decent decline pending. Trade safe.